Schools are having to be more creative about how they keep students studying foreign languages. The two schools below have used fast track French and mandatory Mandarin. Many schools have experimented with fast tracking GCSEs at the end of year 10. However, to our knowledge, ours is one of the few to allow pupils to take a GCSE in French at the end of year 9. This was central to our gaining language college status in March 2002. The initial impetus was the desire to give new life to modern foreign languages within the school. MFL was traditionally the worst-performing department, suffering from low status, poor student recruitment and problems with motivation. A radical solution was needed and, following consultation with staff, the decision was taken to prepare pupils for their GCSE in year 9. The topic content seemed more appropriate for the age group and a fast track approach would obviate the need to revisit topics already studied, with a knock-on effect on student expectations and the pace of learning. The students in the top two language sets study French for six periods over the three years of key stage 3, continuing with AS level French (or GCSE booster with a C grade) in years 10 and 11 in addition to studying a second language to GCSE. Other sets follow a more traditional pattern of one or two languages at key stage 3 depending on their ability. An extra period was given to languages from English in year 7. Additionally there are two year 9 examination preparation days and an exchange or study visit to France. In key stage 4, as part of the language college bid, the top half of the year groups study two languages - and this has an obvious impact on option choices. The rationale behind the fast track programme is presented to the chosen pupils who are given a Guide to Fast Track booklet, which offers advice for language learning. They are made to feel part of a ground-breaking initiative. Some pupils initially questioned the programme, some have felt pressured, but most have been excited about taking a French GCSE two years before their peers. Certainly once top GCSE grades are obtained on pieces of work, pupils share a real buzz and an ownership of the programme. Being in a fast track group now has real kudos! We have also involved the parents, who are sent an outline of the programme, an order form for software and revision guides and ideas to help support their child's learning. Only a few have expressed concerns over exam pressure in SATs year but dialogue and a planned two days off timetable to explore GCSE exam techniques have allayed concerns. We have also issued interim French reports to parents to keep them informed of their child's progress throughout the year and to help us track the progress of pupils between sets. The experiment has produced exceptional results with one year 9 boy this year achieving one of the top five results nationally. Fast tracking requires a considerable amount of drive and energy on the part of the staff. The benefits, however, have been enormous. Overall the biggest impact has been the positive culture shift within the whole school to a focus on pupil learning and the sharing of good practice. Our decision to offer Mandarin Chinese to all pupils from year 8 was in part a response to the school's linguistic diversity - we wanted to give all pupils the chance to start from the same level with a language they had not encountered before. Mandarin's growth as an international business language was also a factor. More than 50 different languages are spoken within the school, and 58 per cent of pupils are bilingual or multilingual. Language competence and intercultural understanding have therefore played an important role in developing this new school community. Kingsford opened in September 2000 with 260 in year 7 and has had to manage a period of rapid expansion and change. The school now has 1,500 students. Mandarin is a demanding language and initial progress is slower than in other European languages. We have spent considerable time supporting pupils beyond the initial stages so that they can access courses at the appropriate level. Mandarin has been available as a GCSE option at key stage 4 since September 2004 but, even where students do not continue with their studies, they receive certificates of achievement at the end of year 9. Only those in year 9 doing ASDAN basic skills do not attend the Chinese lessons. Learning through understanding and appreciating a different culture, ideas and people is a fundamental part of the languages curriculum. Generally, there are fewer resources available for Mandarin, which means that teachers have had to develop their own worksheets and other materials. These are structured around national curriculum requirements and incorporate significant intercultural awareness. The worksheets are lively and accessible, with lesson topics such as 'Chinese New Year', 'discover Shanghai' and 'discover Beijing'. Teachers were recruited from a variety of sources, including teacher assistants from a British Council scheme and initial teacher training at Goldsmiths University. 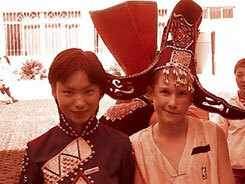 Native Chinese speakers are fully trained and teach ASDAN courses in addition to Mandarin. Every pupil in years 8 and 9 is taught Mandarin for an hour a week during the core day. In addition, Mandarin is integrated into the curriculum across the school - for example key stage 3 English lessons include Chinese Cinderella by Adeline Yen Mah. There are Mandarin clubs in extended day activities, which include calligraphy, painting, cooking and paper cutting. The school has strong links with organisations in China, including three partner schools in Beijing, Shanghai and Hangzhou. Year 10 and 11 pupils have the opportunity to undertake a work experience placement in a primary school in China during the summer term. The HSBC Education Trust has also provided great support. Mandarin Chinese is very much a part of the ethos of the school, and is valued by prospective parents. Students are very positive about learning Chinese and recognise the global importance of the language. Boys in particular are enjoying the challenge of learning a different script and motivation is high. Kingsford is a relatively new school, and in these early stages Mandarin is starting to have a significant impact on take up of languages at KS4. This year 45 students have opted to take Mandarin GCSE and so far the policy of 'Mandarin for all' has been a success. We recently learned that our submission to become a specialist language college was approved. The inclusion of Mandarin in the next pilot stage of the languages ladder is very important. Students will be able to gain credits for a six-stage 'ladder of proficiency' from 'breakthrough' to 'mastery', and they can choose to be assessed just on listening and speaking. Mandarin sets Kingsford School apart from other schools and this is strongly reflected in the views of the students who are in the process of preparing for their GCSE Mandarin exams. As one student said: "The Chinese culture is really interesting and to be able to speak Mandarin is brilliant! Learning Mandarin is easy once you get used to it. I thoroughly enjoyed going on a three week immersion to China because I had the best time of my life!" Joan Deslandes is head of Kingsford Community School, an 11-16 school in Newham, in the Docklands region of London.